Posted on October 24, 2016 at 10:35 am. Halloween is knocking on our door and Slots Million is answering with a $1500 prize pool, 100 free spins, and more. In the days leading up to October 31, the top leading pokies site is offering a huge range of promotions to treat their new and regular players. You can opt in for all of the bonuses to really reap the treats. 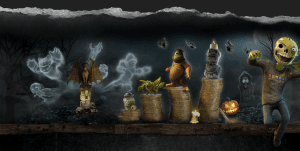 Kicking off today and running until Halloween, players who make a deposit of at least $25 and use it on any of the pokies found under the Halloween category filter at Slots Million, will earn points for the leaderboard promotion. Every $1 wagered will see 10 points earned until the $25 has been used – and then every $1 will score you 20 points. The top 20 players on the leaderboad at 23:59 on Monday, October 31, will receive a share of $1500 and 100 free spins. There’s also a number of other promotions available during this spooky period, which we can take advantage of while we climb our way to the top of the points board. 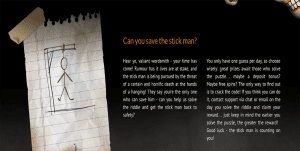 First up is the Save the Stickman promotion, offering a daily treat up until Monday, October 31 at 23:59. If you’ve ever played Hangman in school you will know exactly how to play and win – simply guess the right word to prevent the stickman from facing a hanging. Players only get one guess a day, and if you’re right you can score a deposit bonus, free spins and more. If you’re wrong, just come back the next day and try again. Then on the weekend players can visit the best online casino for pokies to unlock a mystery bonus – which we have a feeling may be a matched deposit bonus. You do need to have made at least one deposit before 10:00 on Saturday, October 29 when the promotion opens. You will also need to make a deposit to claim the prize and you can do it by 22:00 on Sunday, October 30. Perhaps the best promotion on offer however, is the Spirits are at Work promotion, which is available to claim on Halloween. However, we won’t know what we can win until 10am on the day, and it is only available to players who have already made a deposit before. You can take advantage of the offer up until 22:00 that evening, too. The usual promotions are also available, so be sure to check out the promotional page to see what else you can score when playing the best real money pokies on the web. If you don’t have an account, and want to make a deposit before these special events, head to Slots Million to register your details. There’s a number of secure payment methods on offer, too. Players reading from United States can also opt to sign up at Raging Bull Casino who are running their own unique bonuses and player promotions this Halloween – check it out.